She runs six miles every morning, rain or shine. I make about 20 business trips a year. I thought we might hire a motorboat and take a trip round/around the bay. I was determined to make it as a jazz musician. I‘m determined to get this piece of work done today. She will get the job she wants – she’s a very determined person. I’m determined to finish this book today. 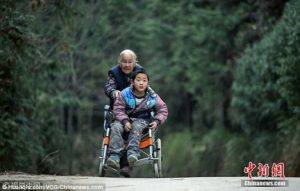 A elderly woman in China has to walk 24 kilometres (15 miles) a day in order to take his disabled grandson to school. 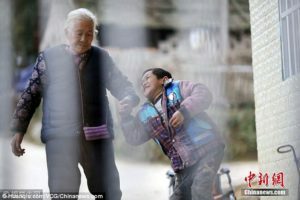 Shi Yuying, 76, makes four return trips a day pushing Jiang Haowen, nine, to school and back in the rural Guangxi Province in southern China, according to Huanqiu.com, an affiliation of People’s Daily. The group has affiliations with several organizations abroad. Membership is open to anyone, regardless of religious affiliation. She‘s very strong-willed and if she’s decided to drop out of school, nothing will stop her. Haowen suffers from cerebral palsy, a brain condition that affect movement and coordination. He cannot walk on his own and needs full-time care. Ms Shi and Haowen live in the Daizhuyuan Village, Huangguan Town in Guangxi Province’s Guanyang County. 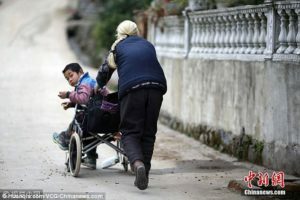 Since then the elderly villager has been using the wheel chair for the school run. Ms Shi told Pear Video that Haowen diagnosed with cerebral palsy when he was about two years old. The boy’s parents took him to see the doctor because he hadn’t been able to walk. Musicians have raised millions of dollars for famine relief in Africa. A shuttle bus makes the run from the station to the airport. I’m doing the school run this morning. She was diagnosed with/as having diabetes. Chrysanthemums are such beautiful flowers, and what’s more they are very easy to grow. The decorations were beautiful and, what’s more, the kids made them themselves. We ran into bad weather/debt/trouble. Our project ran into difficulties when we lost a sponsor. 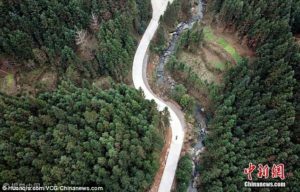 Haowen’s school is located about three kilometres (1.86 miles) from his home. 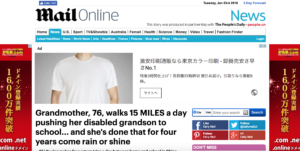 This means Ms Shi would have to walk a total of 24 kilometres a day. However, Ms Shi said she was happy to take on the task. She also said though Haowen couldn’t move freely, he is a smart child. Ms Shi said the boy is particularly good at maths and has excellent memories. Apart from doing the school run, Ms Shi also looks after all aspects of Haowen’s life. She said she was looking for a good school for disabled child, hoping she could send Haowen there one day. Apart from you and me/You and me apart, I don’t think there was anyone there under 30. Apart from providing humanitarian aid, the UN is also supposed to enforce agreements.